OOEEUG! Fire the Makeup Department! Mouse-over for the earlier version! I ponder Mark’s makeup, the insensitive treatment of dead Jawas, the Star Wars/Empire double-bill in 1980, the accuracy of Stormtroopers and alternate tinkered-with artwork. Which makes George not much worse than me when it comes to the treatment of culturally important works! Blimey! Luke looks a bit tarty in this one doesn’t he? Burgundy lipstick on the top lip, with orange on the lower one. But do you know what? 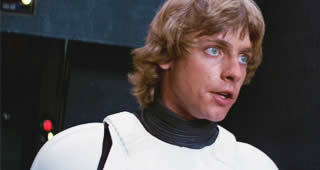 During the rescue scene, I think Mark Hamill also looks a bit weird. Skinnier and with thick looking make-up. Perhaps he was still sunburnt after Tunisia? Certainly looked at odds with the earlier scenes. Pull the other one. When I finally talked my mum and dad into seeing the film with me for my third viewing (over 3 years later) when it was re-released along with Empire Strikes Back as a double-bill in 1980? – one of my mum and dad’s remarks afterwards was “Those baddie soldiers weren’t very good shots were they?” Of course, I shrugged awkwardly and mumbled something – probably partly embarrassed and partly wondering why they had to over-analyse things! Still, it was a big thrill to bring them to it after having raved about it at them non-stop for 3 years. 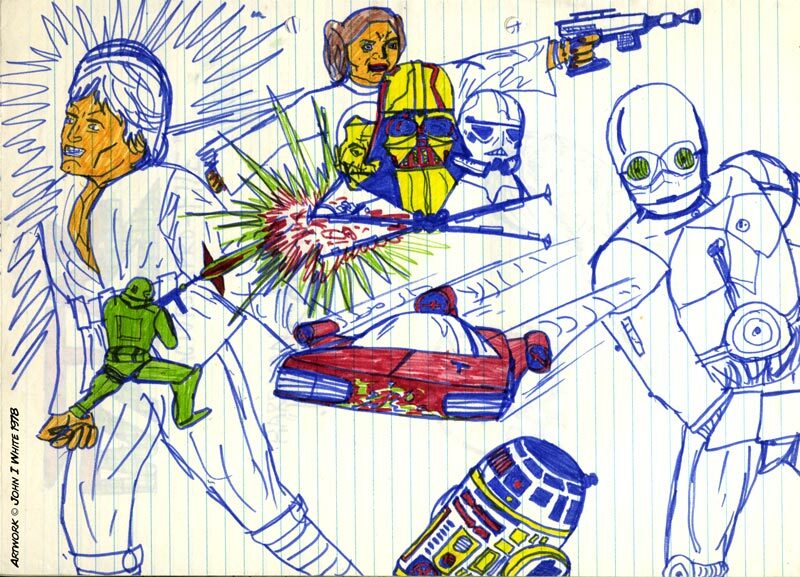 Looking at the top drawings, I reckon this was a very early one – 1978 perhaps – but I went back over it much later. That bottom – tarty – pencilled panel probably wasn’t even there for a year or two. And even later than that I may have returned to it again and added Ben’s closing line (Very Lucas-like tinkering). Actually, the very first line seems to have been added later too. 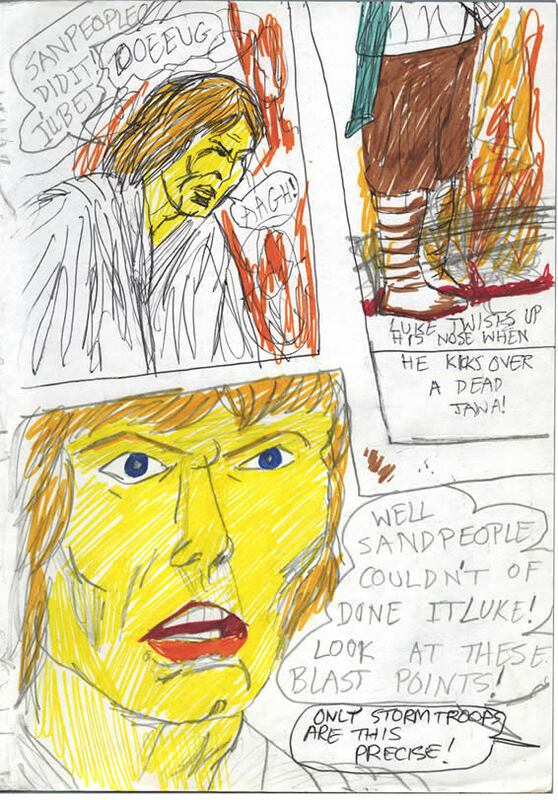 The earliest version of this page then, started with Luke making those “OOEEUG” and “AAGH!” noises. I like that – more visually focused. I had a go at removing these additions, below. Unfortunately I can’t remove the coloured marker. Luke Skywalker is standing beside the burning Jawa landspeeder, flames behind him. "Sandpeople did it, I'll bet!" says Luke. And he thinks "Ooeeug." And shouts "Aagh!" "Well sand people couldn't of done it Luke!" says Ben Kenobi. "Look at these blast-points! Only stormtroopers are this precise."